Nick Malgieri has journeyed far and wide during his thirty-plus years working as a professional baker. His experiences abroad have always informed the flavors and techniques of his recipes. Now the award winning master baker transports the world's greatest kitchens and bakeries to your home with this inspired gathering of more than one hundred cookies, cakes, breads, sweet and savory pastries, pies, and tarts, from the baking traditions of thirty-nine countries. Look no further for chewy naan from India, rich chocolate Millennium Torte from Vienna, and crisp cannoli from Sicily. With A Baker's Tour at your fingertips, you don't have to tour Monaco for Prince Albert's puff pastry cake, Poland for the lightest, most flavorful babka, or Argentina for perfectly seasoned beef empanadas -- you don't even have to go to country-specific cookbooks. The recipes here range from casual to sophisticated, and all have been adapted for American use, ensuring consistent, delicious results without sacrificing flavor. 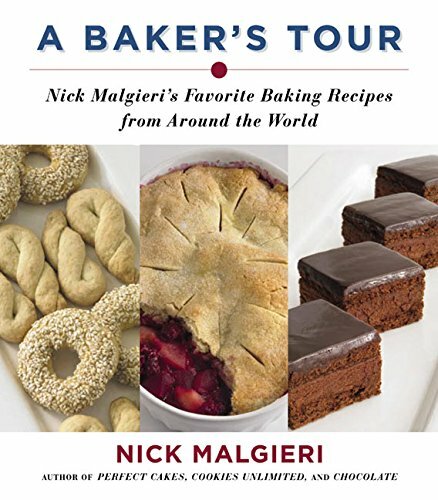 Supplemented by illuminating food facts and anecdotes, and illustrated with gorgeous full-color photographs, Nick Malgieri's A Baker's Tour is a satisfying and educational international collection of inviting, delicious recipes for home cooks and food lovers everywhere.